Minister says, "a lot of people are imprisoned by debt"
(CNN) -- Jennifer Pedley had very little interest when her husband, Ken, suggested three years ago that they enroll in the Financial Peace University program their church in Brighton, Michigan, was offering. 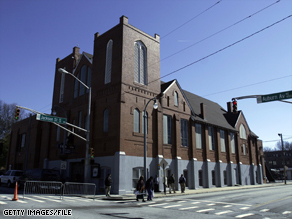 Ebenezer Baptist Church in Atlanta, Georgia, is seeing an increased need for financial programs. The couple signed up to learn how to reduce their debt and get on a budget. Partway through the course, a light came on for her, Pedley said. "I started to see the changes it was making not only in our money but in our relationship," she recalled. "It was unbelievable, but 80 percent of personal finance is personal. There is so much related to communicating about money and communicating about life." Now Pedley is facilitating the course at 2/42 Community Church, where many in the area depend on the auto industry for their livelihood and are struggling with a deepening recession. Programs that teach debt elimination, financial literacy and money management are gaining popularity among the faithful who are seeking some stability in the midst of uncertain times. Lynnette Khalfani-Cox is a personal finance expert and author who has launched the Zero Debt Tour, a financial literacy initiative designed to teach people how to better budget, manage credit and debt wisely, and save money. Khalfani-Cox, who provides the program free for churches, said she is hearing from places of worship, both big and small, nationwide who want to offer resources to their members. "In faith-based communities, if you ask pastors across the country, many will tell you that attendance is up; however donations are down," said Khalfani-Cox, who is known as the Money Coach. "People are turning to the church for help, whether it's help making their mortgage payment, putting in a prayer request, assistance in finding a job or just getting practical, day-to-day strategies for managing debt." Jeff Foy, manager of training and evaluation for the Church of Jesus Christ of Latter-day Saints Employment Resource Services, said traffic has increased to the church's Providentliving Web site, which offers resources on family finances and employment assistance. It's very difficult to reach someone spiritually if they are struggling temporally, Foy said, and some have had to sacrifice time with family and church to pay the bills. "We see a lot of our members perhaps that wouldn't ordinarily be working on a Sunday that are working on a Sunday instead of attending some of their meetings," he said. The Rev. Steve O'Dell of 2/42 Community Church said he believes that people have a desire to give more of their time and money but just don't have the means. That's why programs that help get them on track financially are beneficial, he said. "A lot of people are imprisoned by debt," said O'Dell, whose church has expanded the number of Financial Peace University sessions to meet the growing need. "If people are in place where they are not going further and further into debt and all of their money isn't going into paying off debt, then financially they are freed up to give to things they would like to give to," he added. "Whether that's the church or charitable organizations or places that reach out to people in times of need." Joel Schwartz is director of the Moving from Debt to Assets program, which was founded in 2005 by the Greater Boston Interfaith Organization. It offers sessions on finances, a peer support group and private sessions with a financial counselor. Schwartz said that since its inception, Moving from Debt to Assets has graduated more than 400 participants and now has half of its groups run in languages other than English. What makes his program and others like it so effective is that they are offered through organizations that have a relationship with those participating, Schwartz said. "It's embedded in institutions that are part of the fabric of people's lives," he said. "This creates a lot of opportunity for reinforcement. People who see each other every Sunday can say, 'How are you doing paying down those credit card debts? I know you are working hard on that.' "
Programs like Financial Peace University and Crown Financial Ministries, which have components that speak directly to biblical principles about money, have been seen as integral to the ministry. At Ebenezer Baptist Church in Atlanta, Georgia, a stewardship workshop series based on Crown Financial Ministries "Road to Financial Freedom offers topics like "Who's in Control?" which covers God's responsibilities versus those of the believer, and "A Slave to the Lender," about living debt-free. Kevin Stacia teaches stewardship at Ebenezer and said that with everyone from the wealthy to the disadvantaged being affected by the economy, it makes sense for churches to offer such programs. "We always want members of the church and our community to be grounded in how God wants us to manage the things he has entrusted us with," Stacia said. "We want to give people an avenue to get knowledge and understanding." Cheryl Spiva has attended the series and said education is the key. Spiva retired at 45 from her position as senior vice president of sales for the southeast division of the investment group Charles Schwab and said financial education programs can be empowering. "Often, people don't really know what to do with their money," she said. "If you give them tools, they become more confident and they make better choices." Jennifer Pedley said she and her husband have benefited from learning how to manage their money more effectively. They have paid off a car and their credit cards and are well on their way to being debt-free. Pedley said they are also much better off in the current economy than had they not taken the course. 'When we took [the course], people had questions like, 'How do I budget vacations and going out to dinner?' " she said. "Now it's, 'How can I pay my mortgage and save my house?' "
And despite her initial resistance, Pedley said, she views it as a learning and growing experience. "I never realized how practical the Bible is about money," she said. "It just makes so much sense."